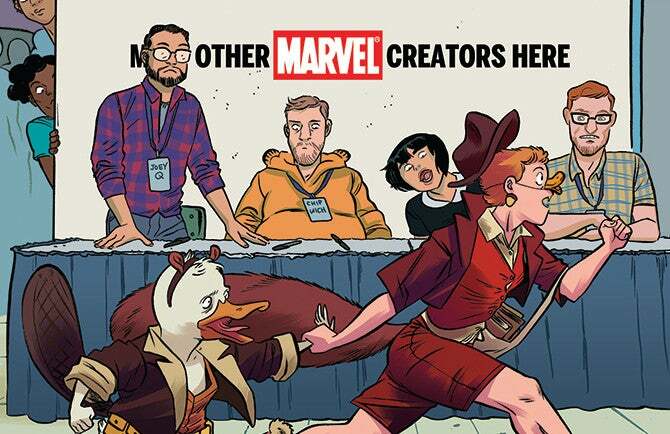 From the “Women of Marvel” panel at New York Comic Con, Marvel Comics today announced a Squirrel Girl/Howard the Duck crossover story coming in 2016. The crossover will take place in The Unbeatable Squirrel Girl #6, from writer Ryan North and artist Erica Henderson, and Howard the Duck #6, from writer Chip Zdarsky and artist Joe Quinones. Hi this is Chip, Ryan wrote all of the above. I have no idea what he’s talking about, I just found out about this crossover. Look for the Squirrel Girl/Howard the Duck crossover this spring.